The holidays are just around the corner and although garbage disposals can get clogged anytime of the year, it does seem that we get more calls for clogged disposals during the holidays. So, how do you unclog a garbage disposal? Several possible methods to unclog garbage disposals include using a recipe of baking soda and vinegar or baking soda and salt or boiling water (caution using boiling water) or using a plunger or using a plumber's snake. If any of these do not work we recommend calling in a professional plumber. It makes sense that the holidays would see an increase in clogged disposal units. There is more food being cooked, more friends and family in the home all resulting in more overall usage of your kitchen sink's garbage disposal. If you can follow the guidelines on how to properly use your disposal then you can usually avoid any blockage problems. 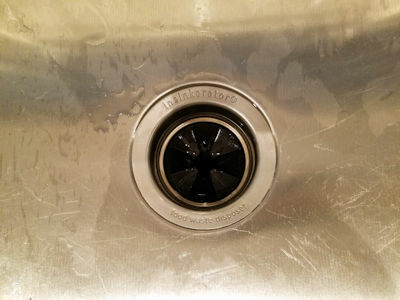 Check out our Cheat Sheet of what NOT to put down your garbage disposal. Some clogs can be minor and you can take care of the problem quickly with a home made solution. But if the disposal keeps getting clogged or you are unable to unblock it, we recommend you call in a professional plumber. It may be that the blockage is further down the drain pipe making it very difficult for most homeowners to resolve the issue. There are a few easy things that you can try to unclog your unit before you call in a plumber. NOTE OF CAUTION: We do NOT RECOMMEND pouring boiling water down your water pipes UNLESS your pipes are made out of Iron, Copper or Galvanized Steel. If your pipes are made out of Pex, CPVC or PVC we recommend that you avoid using any of the solutions requiring boiling water. Try pouring 1/4 cup of baking soda into your sink drain and then follow it with 1/2 cup of white vinegar. You will see some "fizz" coming out of the drain in a few minutes. Wait 10 minutes and then run the faucet with very hot water for about 3 minutes. If the blockage is still there, repeat the process 2 or 3 more times. If this solution does not work, you can try any of the following solutions. Another easy solution is mixing 1 cup of baking soda wih 1/2 cup of salt. Pour this mixture into the drain and let it sit for 3 hours. Heat up a few cups of water in a pot or tea kettle until it boils and then pour the boiling water down the drain. If this doesn't work the first time, repeat the process 2 or 3 more times. Again, if this second solution does not work, you can go on to the next DIY technique. With this method you would just pour 1/2 cup of salt down the drain, follow it with a pot or kettle full of boiling water. Wait about 10 minutes and then run the faucet with very hot water for about 3 minutes. If this doesn't work the first time you try it, repeat the process 2 or 3 times. Or, you can attempt the next possible solution. Here you are not pouring anything down the garbage disposal except for a pot or kettle full of boiling water. Be careful to pour it slowly so that you don't get a back splash of hot water on yourself. If the clog is not too severe and it's easily dissolved, then this simple method may just work. Of course, try it 2 or 3 times and if it doesn't work, you can then move on to the next possible solution. A plunger may be the solution you need to completely unclog your disposal or at the very least, dislodge the clog enough so that any of the above solutions may work to finish the job. Here is the step by step guide on using a plunger on your kitchen sink. If you have a double sink - seal off the side without the disposal using a wet cloth or a stopper. Fill the sink with the disposal with about 3 inches of water. Enough to engulf the bottom of the plunger which will then create a tight seal. Place the plunger securely over the drain and plunge forcefully 5 or 6 times. Lift the plunger, if the water in the sink drains away then you have successfully cleared the clog. If you notice that the water is not draining, repeat the process 2 or 3 times. If you notice that the water is draining very slowly, either repeat the process with the plunger or try one of the other solutions above to further clear the blockage. If you are a handyman of sorts and you own an auger (a plumber's snake) then you may try to unclog your disposal unit with it. You would first have to dis-assemble the drain pipe, the P-trap and then run the snake into the pipe that runs behind the cabinet wall under the sink. Of course, if none of these solutions help your clogged garbage disposal, we urge you to call in a professional plumber to fix the problem. Can You Pour A Drain Cleaner Down A Garbage Disposal? Using a drain cleaner like Drano is not recommended. The reason is that the chemicals can be abrasive to the plastic parts and the metal blades in the unit. If you need help to unclog your garbage disposal, call the Atlanta plumbers - Atlantis Plumbing today at 770-505-8570. We are available every day (including holidays) - 24 hours a day, 7 days a week.